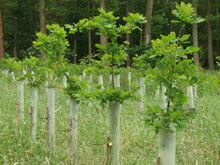 Parkton Woodland Services has been planting trees for over 20 years. As a local company, our level of expertise is unmatched. We specialize in government programs for stream buffer establishment and mitigation planting for private development projects. 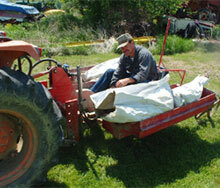 Most of our tree plantings are done by a tractor pulled tree planter. We will arrange and supervise the tree planting, perform any site preparation, select and purchase the seedlings, and perform post-planting herbicide releases and maintenance. Ninety five percent of our tree plantings require the use of protective tree shelters. We sell tree shelters (Tubex brand), and deer repellents. Tree shelters are placed over the newly planted seedlings to protect them from deer and to provide an improved micro-climate for greater initial growth and survival. 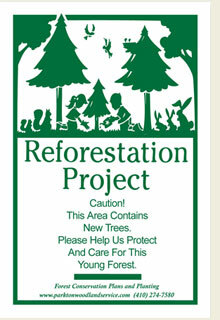 Our experience has shown that failure to install tree shelters will result in a failure of the planting. For prices, download our price list. If you have further questions, please call (301) 293-2727 or email for pricing. Discounts may apply on orders over 10,000 shelters. Delivery available. 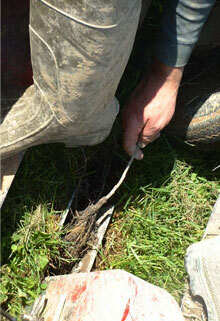 Planting a seedling with a hardwood planting shoe. A tractor drawn planter is ideal for planting open fields.